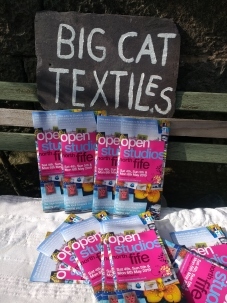 This year Jeanette is again opening her studio at Big Cat Textiles as part of Open Studios North Fife. 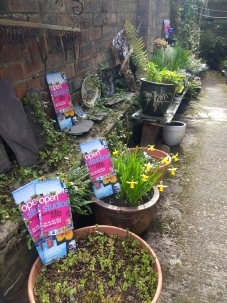 Jeanette’s creative output ranges from millinery, tailoring and costume design to performance and installation art, community work and teaching. Her spacious and quirky studio mirrors the unique journey she has taken since arriving in Newburgh in 2007. She has collaborated with many national and international artists and currently runs a summer school programme, themed predominantly around textiles. Her own work makes reference to these exciting cross media collaborations and is beautifully displayed in the inspiring studio space. Come and see an array of costumes, hats, artwork and luxurious accessories set against the raw stone backdrop of her Big Cat studio. 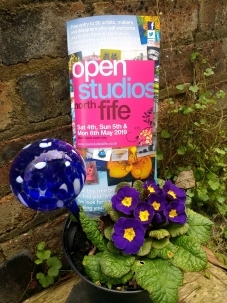 Sharing the venue in the space upstairs is Molly Bullick, who this year is joining Big Cat Textiles in Newburgh rather than exhibiting in her home studio in Letham. Molly is showing a range of wall hung textiles, work in encaustic, plus paper works using indigo and Sumi ink. In addition she will have scarves in linen, silk and wool using natural dyes, and a small selection of cards.